Piedras Blancas is located in the Central Coast region of California, within the Monterey Bay National Marine Sanctuary. This site is located within the Piedras Blancas State Marine Reserve. The property adjacent to Piedras Blancas is an old lighthouse station and public access to the area is restricted. The land is managed by the Bureau of Land Management, and docent-led public tours are occasionally done, but access to the intertidal has been limited to researchers. The area to the south is an important elephant seal rookery, and an offshore island is heavily used by shorebirds and pinnepeds, so localized nutrient levels are likely quite high. This gently sloping site consists of moderately uneven terrain, containing few cracks and folds. 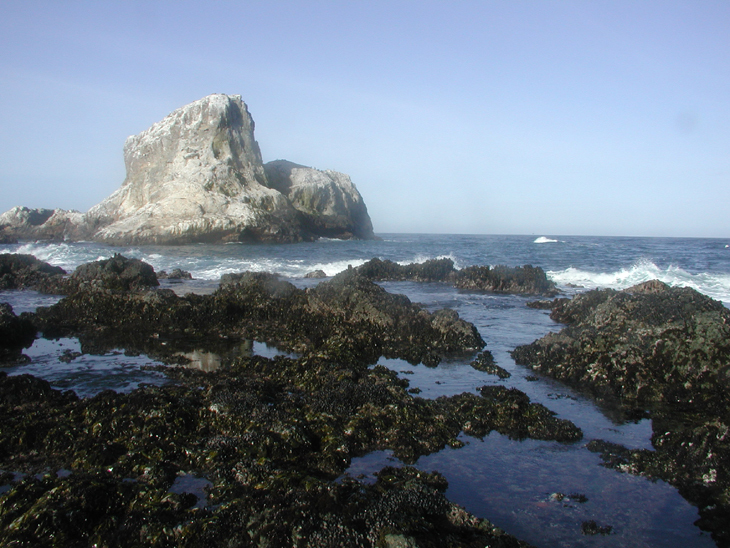 Piedras Blancas is dominated by consolidated bedrock, and the area surrounding the site is comprised of a mixture of consolidated bedrock, boulder fields, and sandy beach. The primary coastal orientation of this site is southwest. 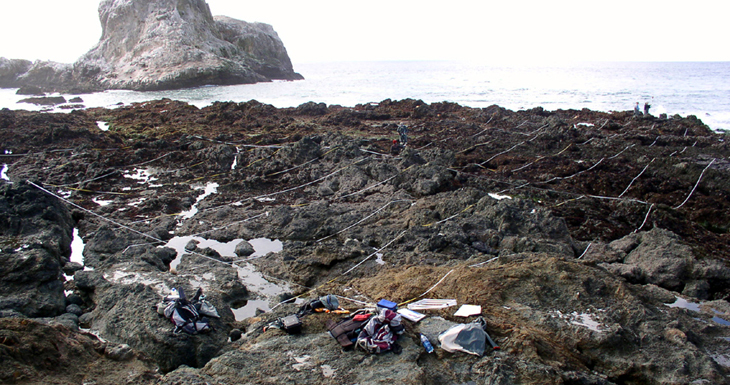 Long-Term Monitoring Surveys at Piedras Blancas were established in 1997 (with expanded monitoring implemented in 2007 as part of the MLPA), and are done by University of California Santa Cruz. Surveys at this site are not done on a regular basis. Long-Term MARINe surveys target the following species: Chthamalus/Balanus (Acorn Barnacles), Mytilus (California Mussel), Silvetia (Golden Rockweed), Mastocarpus (Turkish Washcloth), and Pisaster (Ochre Star). In addition, motile invertebrates, barnacle recruitment, and water temperature are monitored at this site. Click here to view Long-Term trends at this site. Biodiversity Surveys were done by University of California Santa Cruz in 2008 and 2017. The Biodiversity Survey grid encompasses one section that is approximately 30 meters (along shore) x 50 meters (seaward). Click here to view Biodiversity Survey findings at this site. For more information about Piedras Blancas, please contact Pete Raimondi.